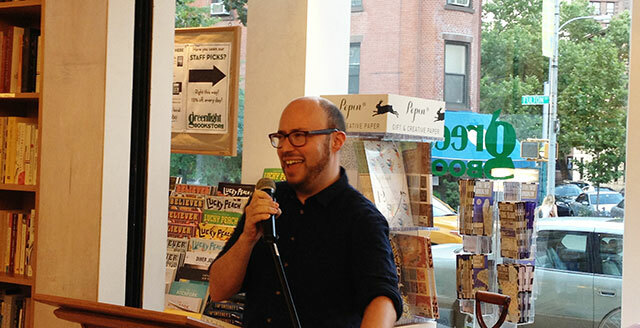 Us Conductors, the debut novel by music critic Sean Michaels, launched at Greenlight Bookstore in Brooklyn on Monday night. The novel tells a fictionalized story about the real life of inventor and musician Lev Termen. Termen invented the theremin, the magical musical instrument played without physically touching the device. Accompanying the launch was theremin expert Rob Schwimmer who performed renditions of Rachmaninoff to demonstrate the instrument’s sound. Lev Termen was born at the close of the Nineteenth century. He grew into being a tinkerer and inventor. Michaels read a scene from his novel dramatizes a scene where Termen discovers vacuum tubes and the power of electromagnetic fields. In the scene, Termen awes a crowd by illuminating filaments in vacuum tubes with nothing more than a electromagnetic field generated by a mass of wiring. 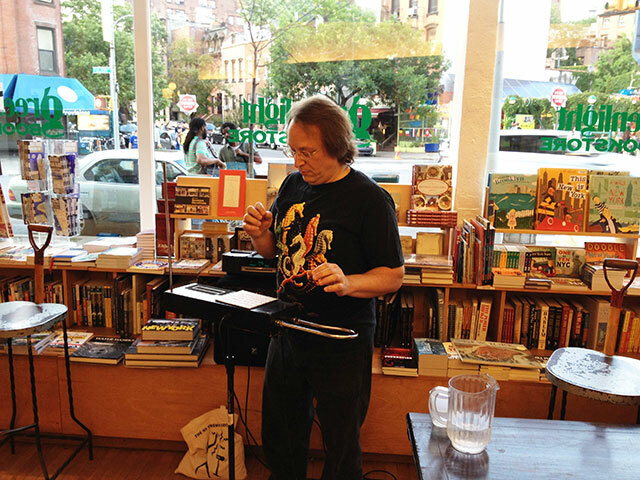 The invention of the theremin made Termen famous. He toured Europe and the United States playing music with nothing but thin air (and a hearty electromagnetic field). Michaels called the instrument the “Google glass of the 1920s” for its ability to attract crowds and onlookers and garnered performances in places like the Paris opera house. Termen was also a spy. During his travels, Termen passed secrets back to Russia. As a scientist, he was particularly valuable as a spy because he understood the materials he was spiriting back home. US Conductors flashes back and forth through time to tell the story surrounding the invention the instrument, his love affair with Clara Rockmore, and his time as a spy. Eventually, Termen was recalled to Russia where, instead of being treated as a returning hero, he is arrested and charged with crimes. Michaels fictionalizes these events in the novel. The theremin offers a haunting musical performance. Oscillators inside the device generate electromagnetic fields. A vertical rod extending from the device controls for pitch. Its highly sensitive, and moving just a few millimeters changes the sound noticeably. The second rod, a loop extending from the side, is lays flat, perpendicular to the pitch rod. This loop controls volume. Moving the hand closer to the loop lowers the volume while pulling back increases it. Schwimmer calls learning to play the instrument “the most difficult thing I’ve ever tried.” There are no frets to act as guides or any physical connection to the instrument. Schwimmer closes out the evening by playing the theremin over the soundtrack to Vertigo.